It’s not easy instituting change in any organization. There are a lot of expectations placed upon you and some of them can be unrealistic if people are uninformed. Although you’ll be a hero if the change brings success, you are also out front to take any of the arrows. If you have stepped up or been given the charge to evaluate or implement mLearning in your company, you are going to bring about change. But that doesn’t mean it has to be a stressful or daunting experience. There are some steps you can take to be well-equipped and smartly positioned to assure that you are headed down the right path and prepared for the challenges that come with any new endeavor. 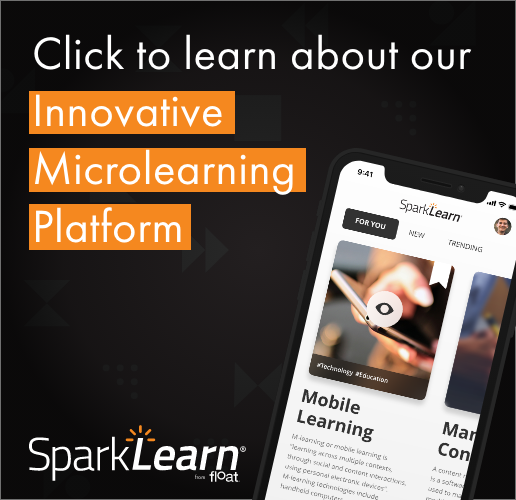 This month’s Float newsletter takes a look at steps you can take so that you are adequately prepared to introduce your organization to mobile learning. By educating yourself on the characteristics, benefits and challenges of mLearning, you will be better able to determine how your company or organization can best use this form of learning. In addition, you will be positioning yourself to develop a business case for mLearning and be prepared to answer the inevitable myriad of questions that will arise as you work to institute a change in how people think and work. As a follow-up to this topic, next month’s newsletter will examine how to take your knowledge and evangelize mobile learning to the rest of your organization. But first, you must prepare yourself. Here are the key steps you should be taking. You will need to take off your water wings and jump into the deep end. If you are going to be the point person for mLearning, you better understand it to a depth that you can have informed conversations and answer most of the questions that will be thrown at you. Start frequenting mLearning blogs and participate in the conversations. Use the comments section to ask questions, give your opinions and let others know you are out there and a collaborator. Follow mLearning colleagues on Twitter by using the hash tag #mlearning. There will be many tweets and retweets that will catch your eye with links to interesting articles, blog posts and statistical information. You can attend mLearning conferences and gatherings of associations in your area. Float just returned from mLearnCon in San Diego and it was a wealth of information and networking. Begin to connect with other people in the mLearning field on sites such as LinkedIn and build your network. All of these activities should have a ripple effect on your knowledge capital and visibility in the field. But you need to be active. You can’t just add your name in a couple of places and sit back and wait. Go to the world, don’t expect the world come to you. If you become active, you will have more information and connections that you know what to do with. It can be helpful to involve a colleague at your organization to get involved. That may sound like funny advice but how much of your device do you actually use? If somebody asked you to input a custom url into your browser could you do it? Today’s handheld units have so many features you’ll be amazed at the power you have been carrying around with you. Download applications that are applicable to your daily needs and even some that are not. How about a kid’s game or a game you play against somebody else on their device? What about an app that uses features like push technology, GPS (Google maps), augmented reality such as Layar, or navigation? When you take your next business trip, do as much as you can on your mobile device: make reservations, schedule meetings, find a restaurant and make a reservation (try going to OpenTable.com on your Android device,iPhone or BlackBerry and see what happens) or check your flight status. Listen to an internet radio station (e.g. Pandora) while you are waiting for your plane. The best part about this advice is that it won’t bust your budget. Most apps are cheap or even free. Also, don’t just limit yourself to smartphone apps, try some SMS (text messaging) applications such as KGB, ChaCha or Text4Baby. Another interesting element of the app stores is that every app has its own usability group in the reviews section. Go ahead and try this: search for an app that you want to download and then read the reviews. What do people like and dislike? What works and what bombs? The more you become familiar with the capabilities of your own device and the devices your colleagues are carrying, the more ideas you will have about how mobile learning can best be used by your organization. It is hard to find uses for a tool if you don’t know all it can do. Let’s face it; you are going to become the company evangelist for mLearning. You are going to have to walk the walk and talk the talk amongst your colleagues. You will need to begin learning what kind of reception your new initiative will receive. As you interact with your coworkers in the hallway, at lunch, before and after meetings, get a feel for their attitudes and perspectives about mobile content delivery. Here are some questions you can try: “What kind of phone do you have?” “What do you like or not like about it?” “What are your favorite apps?” Do you text message a lot?” “Hey, you know that compliance course we all have to take? What would you think if you could take that on your smartphone?” At Float, every once in a while we have what we call a “Lunch and Learn” where one of our employees gives a presentation about a topical subject and everyone brings their lunch into the conference room. Try one of those with your group and give a fun and informative talk about mLearning.